A reader recently sent me a question which I think we can all learn from. Let's start with the higher timeframe first to get a bit of context. 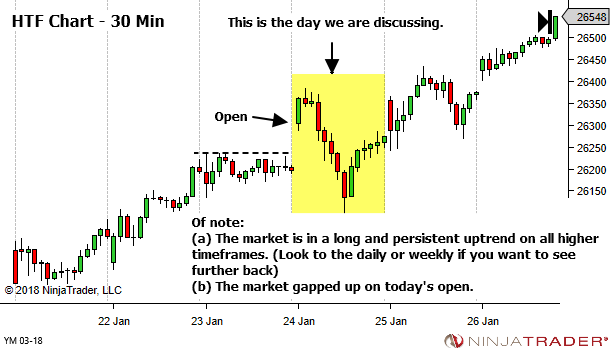 It's the YM (emini Dow) on the 24th of January 2018, if you wish to look at your own charts. But one I didn't properly answer. The reason is that they are in early stages of their development and not yet capturing the OBVIOUS and SIMPLE moves. 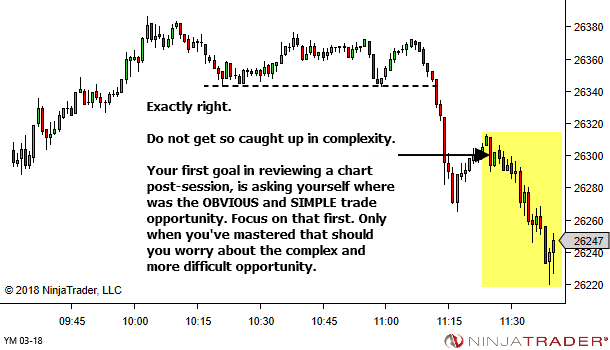 There is a common error I see in price action traders in their early stages of development. 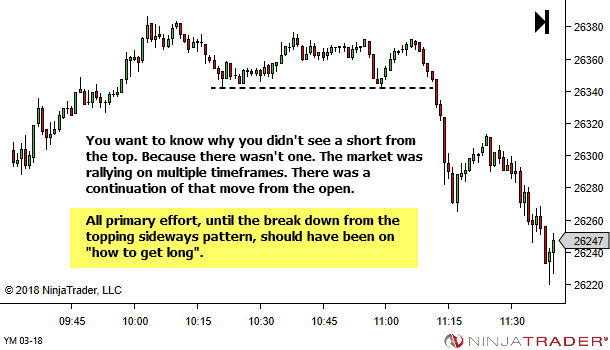 They often have a belief that they should AT ALL TIMES know what is happening in the market. And they often have a belief that they should be able to capture EVERY MOVE in the market. You do NOT have to know what is happening in the market at all times. And you absolutely do NOT have to be able to capture every move in the markets. By all means… learn from every sequences that offers learning potential. This is a never-ending process of skill development. 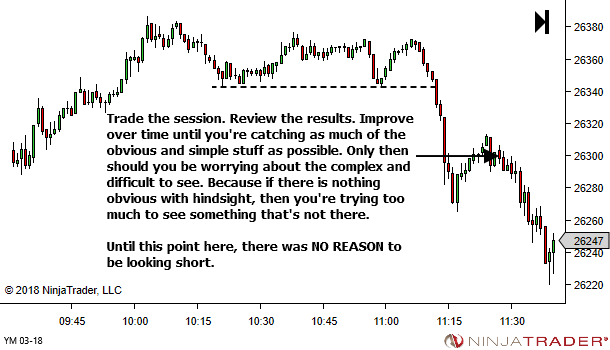 But almost every session contains price moves that, when viewed with the benefit of hindsight, are OBVIOUS and SIMPLE to see. Priority ONE in developing is learning to see and capture these obvious and simple moves first. Get profitable on them. And then later, if you wish to target the more complex moves, go for it. But work on the simpler opportunity first. If you need to ask someone how a move could have been caught, then it's not an obvious and simple one. Focus on those which jump out of the chart and scream at you, "Why didn't you see me? Why didn't you capture me?" 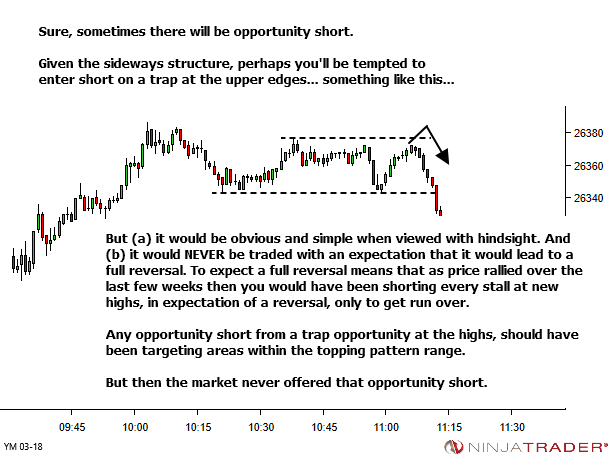 The reader asked how they could have identified the shorting opportunity from point (E) in the above image. 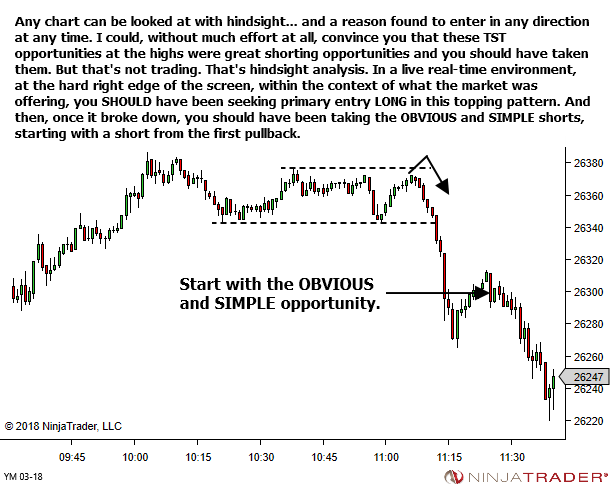 I responded with, "Looking at the whole chart, there is one absolutely OBVIOUS short. Can you identify that for me please?" This is where they should have been focusing, aiming to discover why they did NOT capture this short. You don't have to foresee the initiation of EVERY move. Especially those which break some form of price structure. 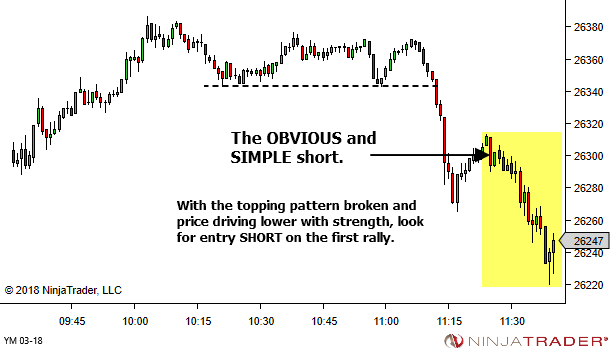 Often in these cases the simpler option is to seek entry on the first pullback. Improve to the point where you are capturing as much of the obvious and simple stuff as possible. Only then, worry about those moves which are more complex and difficult to see. I feel compelled to leave a comment because trying to consistently profit from this exact type of situation had me struggle for the longest time. 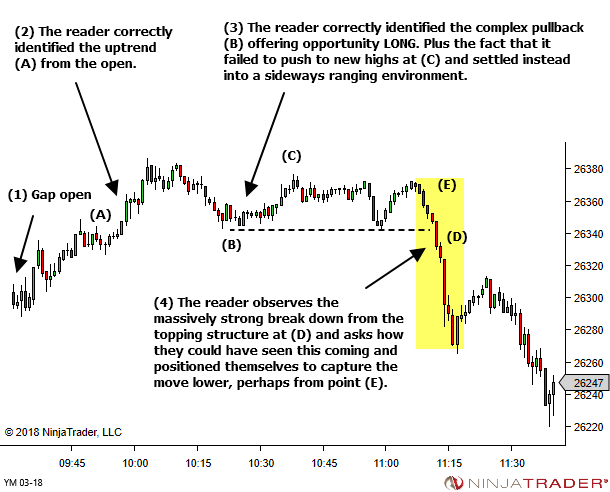 One can predict a likely break (down in the present case), by noticing that the price clusters just below an upper level which itself sits below a previous top (around 10:00 in the chart). The strong push down around 11:00, followed by a much slower push up to the upper level in question, certainly called for a short. Ha ha! I love it! Awesome. Awesome KIS article that makes much sense in the light of the latest S&P and DOW fall. Absolutely. Good point. In times of “market crash” volatility it’s even more important to just keep it all simple.